Anyone who has visited York can not fail to be impressed by the Roman walls which surround the central part of the city. These walls and the archaeological discoveries that are being made all the time attest to the importance of the town in Roman times. So it was not too big a stretch of the imagination to think of York, (or Eburacum to give it its Roman name, ) as being the some-time capital of Britannia. York, the North Yorkshire Moors, the Wolds and the Vale of Pickering: these are the parts of Yorkshire that I feel I belong to me. This is the area that I come from and which I know quite intimately as the result of activities when I was a boy such as cycling along the small country roads until I was lost or at a dead-end, or found a lake or a pond which seemed never to have been visited before. I also went camping on the moors quite often as part of the training provided by the Cadets Corps. at school, and I knew how to navigate at night using a compass. For a time I was a member of the Scarborough Geological Society and we explored the cliffs looking for belemnites and ammonites and dinosaurs’ footprints. We visited such interesting sites as the Kirkdale caves where once the sabre toothed tiger lived – and we found some evidence of it too in the bones we dug up. All these things took place during the 1950s when indisputably life was simpler and there were vastly fewer cars on the roads – and fewer rules and restrictions too. I look back on this as a golden time, and it is one of the kindnesses of the human mind that we tend to remember the good times in preference to the bad. I wanted to pour some of these feelings into a book which would be a celebration of that part of the world, and at the same time, a work with which anyone could identify. Equally, I wanted to avoid simple nostalgia too. I was aware of comparisons with Richard Jefferies whose works such as Bevis and The Story of my Heart had been important in shaping my thinking: and like him, I wanted the book to sound a tocsin. We live in dangerous times when we needs to fight to preserve our values, among which I include our past and our close links with Nature. The title of the whole work is A Land Fit for Heroes, and no commentator yet has commented on the irony implicit in this, for I was writing in the 1990s – a time of massive social and economic disruption in England – but with an awareness of that country’s history from the end of the First World War to the present. I thought the book would require two volumes, but I was surprised when volume two became so long and began to deal with topics as unforseen as the nature of Fascism There was however, a logic to all this, as I was describing people coming to know themselves and demanding answers to important questions. Inevitably, I was dealing with education, and with ideas of social evolution, and individual responsibility as well as the emergence of a hidden but powerful mystical world. I then thought of it as a trilogy, and that is where it should have stopped. Definitely. Volume three could have been longer, but it would have marked a climax and a fulfilment in one broad sweep. But there we are: the book ran to four volumes, and I hope that some of you now reading this will come to enjoy it. Some of the issues it raises are even more pressing today. In this world the Roman legions never quit Britannia. Far from it. The Roman legions marched on and, after stamping their mark on Britannia, conquered the rest of the world. Wherever they trod they established their social systems, their laws and their military organization. Though for a while Roma tottered before the northern tribes, it nevertheless survived to become the capital city of a vast eclectic civilization. Roma became renowned as a great seat of learning; as a cultural melting-pot and place in the sun for all races; as a home of good food, rare spices and fine red wine; as the place for hot gossip, love, philosophy and lust; as the centre of fabulous, profligate wealth and awesome world-rattling power. In the early days after the conquest, the political leader of this society, the Praefectus Comitum as he was called, was appointed from Roma. But soon this position was filled by members of the great aristocratic, military families that settled in Britannia and began to call that province home. These families controlled vast estates and enjoyed almost unlimited power. Their privilege was supported by two classes in the population: the Citizens and the Soldiers. These two classes were mainly drawn from native families who, in the early days, forsook the tribal life and accepted the pax Romana with relish. They became ‘civilized’. But where the city walls ended, the wild wood began. Still, in the forests and moors and swamps which surrounded the Roman towns, life continued pretty much as it had for centuries: as it had since before the coming of the Celts and the earlier generations of men who built Stonehenge, yea back even unto the time of giants. In the different regions of what the Romans called Britannia, the old, green and ever youthful spirits of tree, glade and river maintained their dignity and held sway among the people who lived close to the soil. To those who lived in the vast forests, their ancestors, almost as old as the hills, could be heard whispering in the trees and among the bubbling streams. 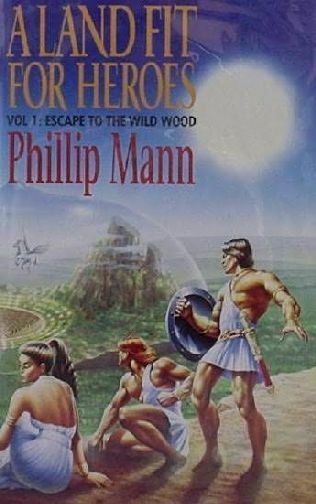 To the ancient Roman families and the Citizens and Soldiers who served them, these woodlanders were primitive savages who could be tolerated because they posed no threat. Christianity sprang up in some quarters but nowhere did it become as great a political force as it achieved in our world. Indeed, where it did survive, Christianity took its place as one sect among many, each of which celebrated in its own special way the sacrifice of a man or woman who chose death in order that humankind might be saved. These various creeds rubbed shoulders with older religions of earth and sky and of the Great Mother. And all races and creeds walked the Roman roads. Of course, on a day-to-day level, nothing seems very different. The sun rises and sets as it always has. The moon waxes and wanes and heaves the seas round the world. Spring follows winter and is itself followed by summer and autumn until winter comes again. But deep change is inevitable and remorseless. It is a law of Nature, there as here. Shortly we will join this world . .
… but for the moment we are drifting slowly above the vast wild woods of the north of Britannia. We are a few miles east and a bit north of the great city of Eburacum which in this world is the capital city of Britannia. In our world this area is known as the Vale of Pickering in the county of Yorkshire and the great city is called York. The time is mid.afternoon and the season springtime. After a bright warm day, the sun’s rays fall slanting into the forest, lighting up the tumbling dust and pollen and the dancing insects in a golden haze. branches mark the courses of streams and reach across to join with the common alder, while stands of beech and oak provide a contrast of shape and colour and presence. The forest is rich and mysterious. When the winds blow the canopy stirs and the branches flex and groan and scrape — the forest is a single creature then, a mighty green organism, which measures its time by season and century. trees close to the village have had their branches chopped back to allow the daylight in. But not so the favoured oak trees. They loom high beyond the hedge and cast their shadows into the enclosures. In autumn the roofs of the houses patter with falling acorns which block the gutters. The houses are made of wood and brick and lath. The roofs are tiled. Many of the houses are built to a circular pattern and rise above the ground on stilts. Beneath them is room for animals. The houses have small windows and high chimneys from which blue wood-smoke rises. Outside the front doors are clumps of rosemary, thyme, lemon balm and mint. Fences define small allotments where turnips grow beside winter sprouts and where the picked-out stumps of autumn crops lie mouldering. Spring ploughing is well under way and in some places early rye and barley, planted in the autumn, are already pushing their bright green spears up through the dark soil. Piles of damp vegetation, rotting marigold leaves, soiled pea-straw and the sodden tangle from ditch bottoms are heaped up at the sides of the fields ready for the compost bins. The village is crowded with people, for the day’s work is ended and it is a time for talking and drinking in the village square. The air is filled with the smell of cooking. Chickens squawk, pecking beneath tables which have been set up in the sunshine. Children sing and cry. Somewhere there is hammering and an argument breaks out. Elsewhere there is laughter. These are the ‘savages’, as the Romans call them; the woodlanders whose fires burn at Beltane. These men and women are descended from the Celts who invaded Britannia centuries before the Romans. In their veins, also flows the blood from the earliest inhabitants of the land, the men and women who built the stone circles and forts in the hills. These woodlanders continue a culture already ancient when the Romans came a-calling and which can trace its ancestry, some say, even back to old Atlantis. Nor are they the only inhabitants of the forest. In the village, spring flowers are sweetening the air as are the pigs which grunt and nuzzle among the oak trees. Cows lumber in the water-meadows outside the village wall. Sheep bleat within fences made of osiers. Bearded goats strain against their leashes, hungry for whatever is beyond their reach. A dog runs from the back of a house and hunkers down in the grass when a voice calls. Narrow lanes which join the isolated cottages into a network meander from beneath the trees of the forest. The paths are all well trodden and each is just wide enough to allow two pack- horses to scrape by one another. Entry to the village is by means of a gate and this is closed every evening when the sun goes down. The gate is topped with spikes and is sufficiently tall and stoutly built to stop a rutting stag in its tracks or a pack of howling wolves. Beyond the villages the lanes meander away and are lost under the trees, only to re-emerge at the next village. To the north the vast dappled forest merges with the misty grey and purple of the Moors: the trees give way to bracken and heather. To the east the forest presses right to the edge of the cliffs which border the grey North Sea. There the trees are stunted and wind-burnt, carved into fantastic shapes by the salt breeze. To the south and west the forest laps round the lower slopes of the Wolds and skirts the salt-marshes where the River Ouse becomes tidal. Then it presses south enclosing hill and river beneath it’s branches. It is said that if you step out under the greenwood just beyond the walls of Eburacum, you need never leave the cover of the forest until you come to the edge of the far southern sea. This vast tangle of trees and undergrowth is the way the land recovered after the last ice age. The forest is home to wildcats, giant wolves and bears. Even a tiger with long shaggy dappled coat and curving teeth has been seen loping under the fir trees near Kirkdale. There are other creatures too, creatures which are rarely seen unless they want to be seen and which move silently. But, though the forest teems with life, as we drift above the trees we see only the flutter of birds and the occasional sparkle of sun on water. In the distance we might see the stain of smoke rising above the canopy of leaves, for today is the first day of May and the fires celebrating Beltane are burning. Abruptly we come to a place where several acres of forest have been cleared. Within this area there is a sharply defined rectangle. Being fanciful, we might imagine that one of the old gods, a Jupiter or a Vulcan say, has used a giant cutter to remove a precise area of forest. The perimeter is defined by high walls of stone and soldiers patrol behind the battlements. There are watch-towers at the corners. Within this cleared area are square fields, long rows of glasshouses, oval ponds where fish are growing, irrigation ditches, graduated water-races and windmills. quality fresh meat and vegetables for consumption in Eburacum and the nearby military camp. Each state farm has a name and a number. Apart from competing in agriculture, the state farms compete in sport and hence the importance given to the central playing-field. Here wrestling contests take place, and races. Two team sports, akin to rugby and cricket, are particularly popular. Just now the rugby posts have been lowered and gardeners are inspecting the damage done over the winter to the central cricket square. Much of all this might be recognizable to us. Unfamiliar would be the tall pylons which surround the entire farm enclosure and which carry on their tops the black plates of solar-energy cells. Solar energy is widespread and advanced in this world and provides the power for most of the farm. Roads join up the various state farms into larger units. These cut, straight as ruled lines, through the rough dappled forest. green glades within from the noisy, peopled roads. The small farm roads join larger highways which cover the entire province. These in turn link up with the major expressways which lead, ultimately, to the great cities of the Empire: glittering Byzantium, vast Roma, marbled Athenae and distant fragrant Xi An, to name but a few. We drift over one such expressway and notice that it is crowded with vehicles, and all are travelling in the same direction which is away from the city of Eburacum and towards Derventio, the town which we know as Malton. Crowded the road may be, but there is no panic. All the vehicles move down the road at a constant speed, like beads on a string, each vehicle separated from the one in front and the one behind by the same distance. In appearance the vehicles look like motorized chariots such as we might see at a fairground. But we notice that the wheels on the sides are merely painted disks and that they do not actually touch the ground. The vehicles slide silently, each on its own cushion of air and each held firmly in the magnetic grip of an expressway monitor. Balloons and streamers, thrusting out from the windows, bounce and strain in the breeze. We can hear singing too and laughing and the occasional pop of a champagne cork. Rising from the median strip in the centre of the road are tall pylons, similar to those found in the state farms except that these are much taller and are capped with twin domes of black and silver. They look like spindly mushrooms and reach well above the highest oak trees in the forest canopy. They are spaced regularly some zoo yards apart. In the breeze they flex and sway as though they are animate and are tasting and filtering the air. Citizens who serve their needs find little of interest in the wild tribes that blow their horns and beat their drums and light their fires beyond the city walls. Finally, the thin pylons support bright lights which blaze down on the road when dusk falls. All the major roads in Britannia are illuminated in this way, which means that at night-time the whole of the province is covered with a spangled web of bright white lights. the Moors where snow still lingers in hollows. Its destination is the famous Caligula Detention and Punishment Camp located near the ancient tumuli above the town which we call Rosedale Abbey. The main expressway continues north to the towns of Caledonia. However, we follow the vehicles which have turned off down Battle Street. This road becomes smaller and uncharacteristically picturesque weaving back and forth round pretty lakes and manicured lawns and stands of yew and elm. The traffic moves more slowly now. It is reaching its destination: the Battle Dome. The Battle Dome is a vast hemisphere. It covers many acres and its sides rise sheer and smooth above the tightly packed trees of the wild forest. It rises, unblemished and sterile, white and alien, high above the trees and then curves majestically inwards to its apex. In the summer there is rain which drums and froth and sluices down the sides. In the winter there is snow which pelts and freezes and caps the surface of the dome with ice causing a shallow depression. At such times the dome’s lights are switched on providing warmth. The frozen mass melts and comes slithering down the sides in crumpled sheets of snow and slush to land with a thump round the dome’s base. After a few moments the roof of the dome reasserts its true shape with a muffled snap. For tonight, a clear star bright sky is forecast with perhaps a few degrees of frost to make patterns on the windows. There are no clouds and there is no wind. The trees stand stiff and still while a crescent moon rises to the south above the distant Wolds. The day is waning and the sun is almost gone. In the light which people call Blind Man’s Holiday, the dome glows a milky blue while part of its surface is stained pink by the last rays of the setting sun. Wherever you looked there were people hurrying about. Fairy lights twinkled and bobbed in the trees while projectors played coloured images over the curved surface of the dome. The land-vehicles, arriving in their hundreds, glided to a halt under the trees and sank on to their false wheels. They disgorged their passengers before lifting again and moving to a ramp which led down to the vast underground chariot-park. on green. And there were many, many more. Everywhere there was colour and pageantry and the buzz of excited voices.